In this Photoshop tutorial, we're going to have some fun with silhouettes. By that, I mean we'll first create a basic silhouette using a technique that will give us the freedom to resize the silhouette as needed without any loss of image quality, and then we'll see how to fill the silhouette with a fun background to create interesting designs! The first silhouette will be created from this photo. The second silhouette will be created from this photo. The "starburst" background created in a recent tutorial. Of course, you can use whichever background you like. If you're creating this starburst background from our tutorial, you'll want to make sure you flatten the starburst image when you're done by going up to the Layer menu at the top of the screen and choosing Flatten Image so that the starburst image is on a single Background layer, which will make things easier later on. As I said though, feel free to use whichever background image you want. Before we get started, I should mention that we'll be using Photoshop's Pen Tool to create our silhouettes, as opposed to something more basic like the Lasso Tool. There's a couple of reasons why. First, getting professional quality selections with the Lasso Tool is next to impossible, and silhouettes created with the Lasso Tool generally look sloppy and amateurish. The Pen Tool gives us all the precision we need to create great looking shapes. The second reason for choosing the Pen Tool is that it allows us to create vector-based shapes which are resolution-independent, meaning we can resize them as needed without any loss in image quality. The Lasso Tool, on the other hand, creates pixel-based selections which are not resize-friendly. They tend to lose image quality after being resized, especially if you need to make them larger. So, for great looking silhouettes that won't lose image quality no matter what size we make them, we need the Pen Tool! Having said that, if you're not familiar with how to use the Pen Tool in Photoshop, be sure to check out our Making Selections With The Pen Tool tutorial first, where you'll find everything you need to know to get up and running with what is, without question, the single best selection tool in all of Photoshop. You can also select the Pen Tool by pressing the letter P on your keyboard. Select the Shape Layers option from the Options Bar. Reset the Foreground and Background colors if needed. With the Pen Tool in hand, the Shape Layers option selected in the Options Bar and your Foreground color set to black, begin drawing an outline around the person in your photo, adding anchor points and moving direction handles as needed. Again, be sure to read through our Making Selections With The Pen Tool tutorial first if you need help using the Pen Tool. The solid black fill is blocking the boy from view. Lower the opacity of the shape layer in the Layers palette. The boy is now visible through the solid black fill. The first silhouette is now complete. Now that we've created our first silhouette, let's move it into its own document. First, we'll need to create a new Photoshop document, so go up to the File menu at the top of the screen and choose New, which brings up the New Document dialog box. I'll name my new document "Silhouettes", although naming new documents is completely optional. The new Photoshop document filled with white. Select the original image, then click on the shape layer in the Layers palette and drag it into the new document. The silhouette now appears inside the new document. The Layers palette showing the shape layer now inside the new document. As I mentioned at the beginning of this tutorial, one of the main reasons why we used the Pen Tool to create our silhouette was because it allowed us to create our silhouette as a vector-based shape, and as a shape, we're free to resize it any way we want, making it as large or as small as we like, without any loss in image quality. 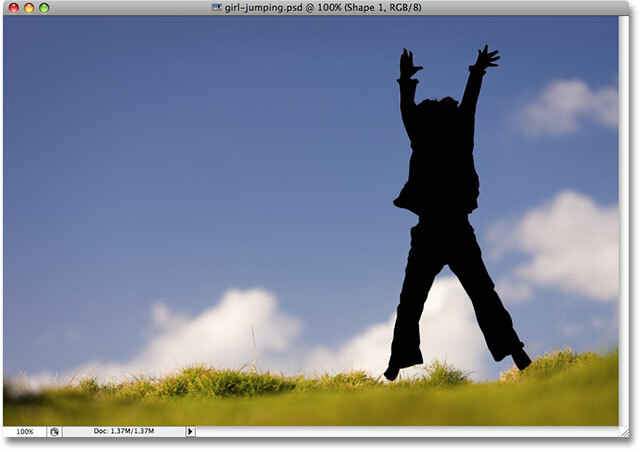 Let's resize the silhouette using Photoshop's Free Transform command. With the shape layer selected in the Layers palette, press Ctrl+T (Win) / Command+T (Mac) to bring up the Free Transform box and handles around the silhouette. Hold down your Shift key to constrain the proportions of the silhouette so you don't distort the look of it and drag any of the corner handles to resize it. If you want to resize it from the center rather than from the corner, hold down your Alt (Win) / Option (Mac) key as you drag. You can also move the silhouette around inside the document by clicking anywhere inside the Free Transform box and dragging the shape around with your mouse. Just don't click on the small target icon in the center, otherwise you'll move the target icon, not the shape. 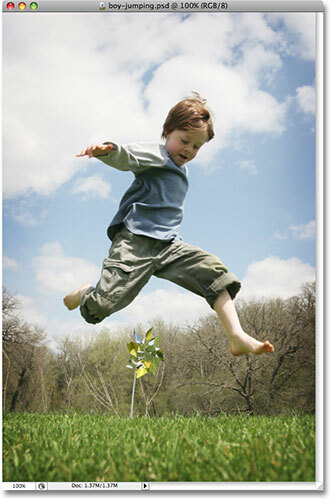 Resize the silhouette and reposition it as needed with Free Transform. Press Enter (Win) / Return (Mac) when you're done to accept the transformation and exit out of the Free Transform command. Open your second image (optional). 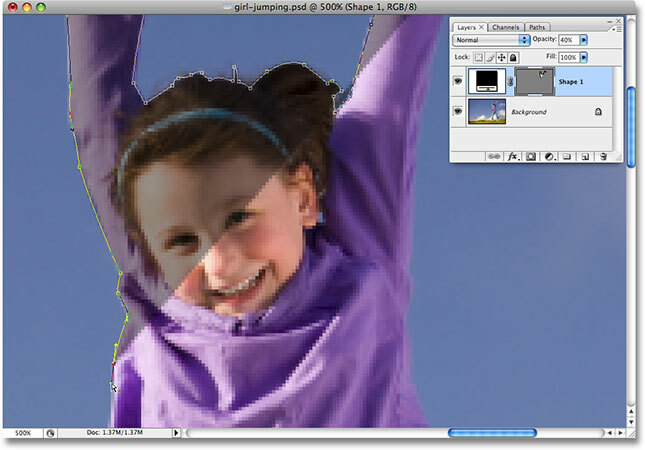 Drawing a shape outline around the girl with the Pen Tool. The second silhouette is now complete. Dragging the second silhouette into the main Silhouettes document. Both silhouettes now appear inside the main "Silhouettes" document. 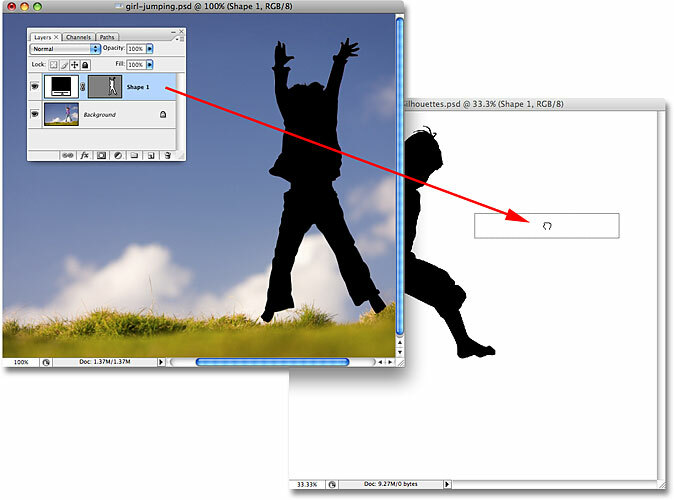 Using Free Transform to resize and reposition the second silhouette. I'll press Enter (Win) / Return (Mac) when I'm done to accept the transformation and exit out of the Free Transform command. Photoshop's Layers palette now shows two shape layers above the Background layer. Renaming the shape layers in the layers palette to avoid confusion. Open the image you want to fill your silhouettes with. 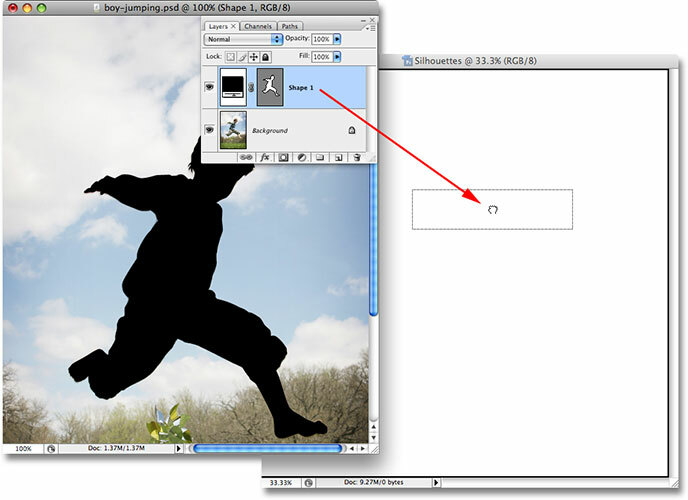 Drag the Background layer from your background image into the Silhouettes document. The background image now appears inside the Silhouettes document. The background image appears on its own layer in the Layers palette above the other layers. The reason why the image appeared above the other layers is because Photoshop automatically placed it directly above the layer that was currently selected. 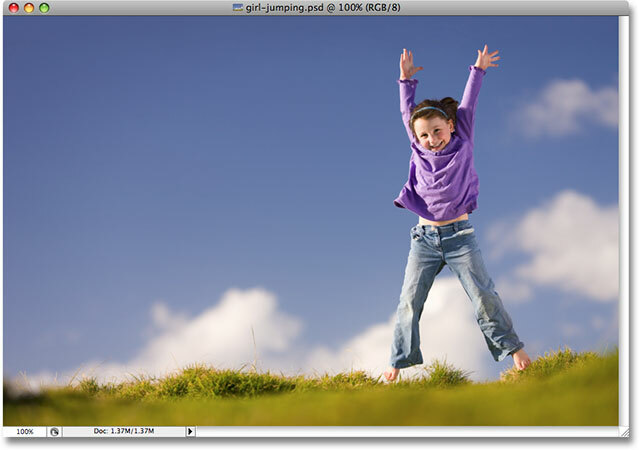 In my case, I had the "Girl" layer selected, so Photoshop placed the background image directly above it. 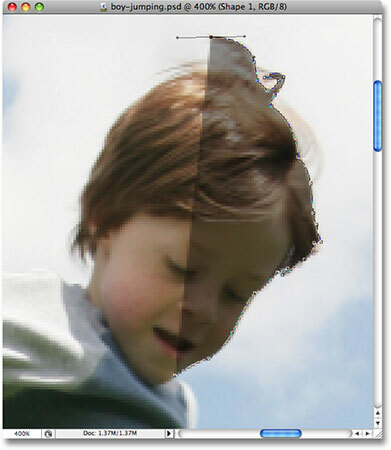 If the "Boy" layer had been selected, Photoshop would have placed the background image between the "Boy" and "Girl" layers. At the moment, the starburst image (or whatever image you're using) is blocking both of my silhouettes from view. Obviously, that's not what I want. What I want is for the starburst to appear inside one of my silhouettes. For that, we need to create a clipping mask, which will "clip" the starburst image to whatever is on the layer directly below it. In my case, the girl's silhouette is directly below it, so when I create the clipping mask, the only part of the starburst image that will remain visible is the area that falls within the silhouette. This will create the illusion that the silhouette is filled with the starburst pattern. Select "Create Clipping Mask" from the Layer menu. The starburst image is now clipped to the girl's silhouette. 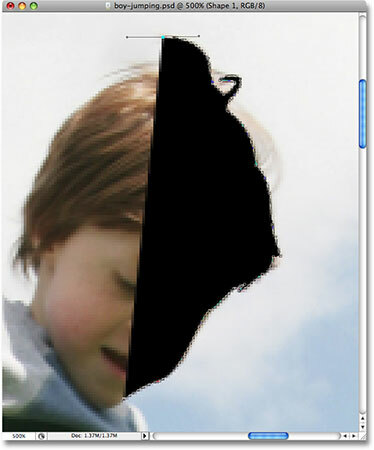 Use Free Transform to resize, rotate and move the image inside the silhouette as needed. The background image now appears the way we want it inside the first silhouette. Hold down Alt (Win) / Option (Mac) and drag "Layer 1" down between the two shape layers. The Layers palette showing a copy of "Layer 1" between the two shape layers. The copy of the background image is now blocking part of the main image from view. The copy of the background image is now clipped to the second silhouette. 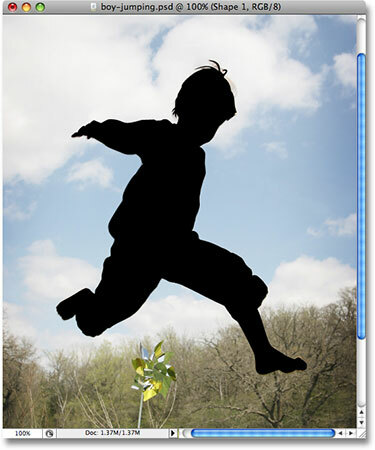 Use Free Transform to resize the image inside the silhouette and move it into place. Press Enter (Win) / Return (Mac) when you're done to exit out of the Free Transform command. Select either of the shape layers, then click on the Layer Styles icon. Select "Stroke" from the list of layer styles. Click on the color swatch to change the color of the stroke. 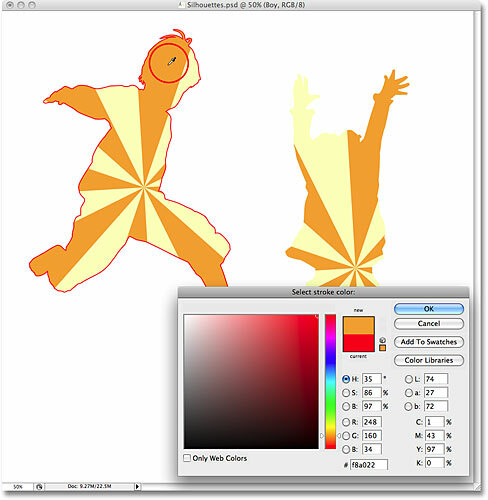 Sampling the orange color from the starburst background inside the boy's silhouette. The orange stroke has been applied to the first silhouette. Select the other shape layer in the Layers palette, then go to Layer > Layer Style > Paste Layer Style. The stroke has now been applied to both silhouettes. I'm going to finish up my design by adding a few scattered stars around the silhouettes. I'll do that next. Hold down Alt (Win) / Option (Mac) and click on the Layer Group icon in the Layers palette. Enter a name for your new layer group in the dialog box. A new layer group named "Stars" has been added in the Layers palette. Click on the small arrow in the top right corner of the Custom Shape selection box. Select the "Shapes" custom shape set from the menu. Click "Append" to add the new shapes in with the shapes already available. Selecting the "5-point star frame" shape. Change the shape color by clicking on the color swatch in the Options Bar. Sampling the orange color from the starburst background. Drag out your first star shape. Use Free Transform to rotate the star shape. Press Enter (Win) / Return (Mac) when you're done to accept the rotation and exit out of the Free Transform command. Add more stars to the design, rotating them as needed. All of the stars appear in the Layers palette inside the "Stars" layer group. Open and close layer groups by clicking on the small triangle to the left of the group's name in the Layers palette. And there we have it! That's how to create fun, interesting designs with images and silhouettes in Photoshop! Visit our Photo Effects section for more Photoshop effects tutorials!